Five years between a first EP and a debut album is more than an eternity these days, where some artists release up to 16 albums in a year… Germany’s Shadowbane are the polar opposite of these artists and five years after their initial EP Dystopia, they finally are offering their debut album Facing the Fallout via the bastion of traditional metal, Pure Steel Records. And there actually is a very good reason for the delay, since it had been in the process of being remastered, when Gamma Ray’s Dirk Schlächter’s studio went up in flames, so that should be accepted as legitimate. 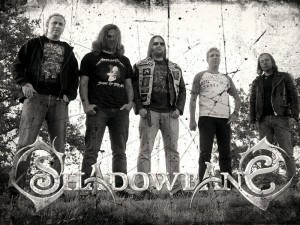 Many bands have their “shtick” and in the case of Shadowbane that is, fitting the EP’s title, a dystopian outlook on the world, or as they call it “post apocalyptic power metal”, which seamlessly continues on their full album. Musically the gentlemen from Hamburg continue the big legacy of top notch power metal from the Northern German city (see also Helloween, Gamma Ray, Running Wild, Paragon, Masterplan, Iron Savior, Metalium, Stormwarrior, to name just the most prominent ones), but it is their edginess in the riffing and also the gruff edge to some of the vocals that manages to set them apart from many of their peers. And while the melodies still manage to soar and are catchy, they keep this darker undercurrent that stands in line with their “post apocalyptic” theme. Sporting three of the five tracks off the EP, Facing the Fallout continues right where Dystopia had left off, nicely heavy guitars, powerful vocals and this already mentioned edgy feeling gives “Beyond the Winds of War” this crunchy character that definitely is a far cry from the “happier” power metal fans out there, here and there the track even reminds of the criminally underrated Wardog. And it is this basic recipe that the Germans dish up in its different, and very tasty, varieties, be it the up-tempo crackers “Traitor”, “After the Fallout” or “Source of Grief”, Blaze Bayley-reminiscent “Tear Down the Wall” or variable “Under Bleeding Skies” and “Dystopia”, all of which remain firmly within the band’s spectrum, but remain anything but one-dimensional. As to be expected from a Schlächter production, there is power, there is volume, lending its qualities perfectly to round off the band’s powerful sound. 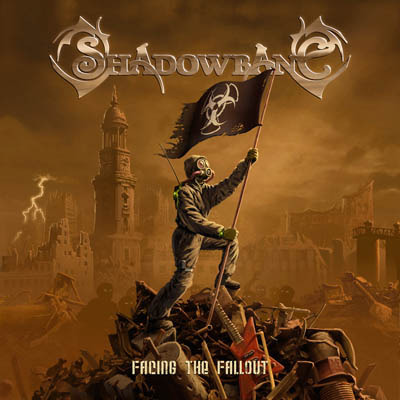 While not necessarily being overly original, Shadowbane’s first is a very entertaining album that steers clear from the usual power metal stereotypes and convinces with strong songwriting, an edgier direction and with that is a fresh breath of fire in the power metal genre! This entry was posted in Reviews and tagged 2015, 8.5, apocalypse, gamma ray, germany, power metal, pure steel.